Apptituda works with a diverse range of organisations on a broad range of App development projects. Here are a few which illustrate the type of work we do. Maestrosoft provides specialist software and services which help the organisers of charity auctions to manage and run large scale auctions in Canada and USA. 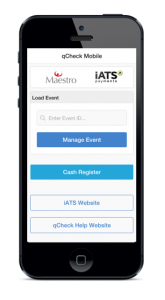 Maestrosoft’s brief to Apptituda was to create a mobile app which enables the organisers of Charity Auctions to be able to pre-authorise and charge credit cards, when bidders have successfully purchased an item in an on-line or physical auction. Apptituda built a mobile App, called qCheck Mobile using Mobile Salesforce SDK (Software Development Kit) and Cordova technologies, which integrates with Salesforce and Maestro’s existing Auction management system. qCheck Mobile runs on mobile devices, with business logic operating on Force.com. qCheck Mobile can be downloaded from iTunes. The App was built to specification as part of a 6 month programme and successfully integrated with the Unimag credit card reader and the IATS payment processing platform. Using the Cordova platform meant that IOS and Android versions were built using a single code base. As a next phase of the project, there is the potential to monetise the App and place other services from Maestrosoft into the Salesforce market. The development of the qCheck App on Force.com demonstrated what a great platform it is on which to create multi-tenant add-on Apps that integrate into the main Salesforce.com App. Julian Clay the founder of Sales to Success has had a lifetime’s career of sales consultancy, training and management. Julian held a vision for many years, which was to provide an App which brings to life some key principles of his leading sales methodology. This has been achieved by the launch of Forecastmanager, an App which is fully native to and integrated with Salesforce’s SalesCloud. Julian is an expert in understanding and helping businesses solve their key sales challenges. He has huge knowledge of how new customers are won, how they are developed and how continual sales growth is achieved. He approached Apptituda after having talked with several other Salesforce Product Development Outsourcing Partners (PDOs) about how his ideas could be brought to life. Working with Julian, we created an App which operated exclusively on the Salesforce platform and which enables medium sized enterprises to improve their opportunity qualification and the accuracy of sales forecasting and reporting. Forecastmanager provides a reality check for every sales opportunity, leading to higher close rates and reflects the DNA of a winnable sales opportunity. It also provides sales managers and sales persons with information and a structure with which to improve sales competence and individual performance. Forecastmanager is one of Apptituda’s full project lifecycle Application developments, as we worked with Julian from concept to launch on the AppExchange and its go-to market plans and activities. Following the launch of the App, we we have continued to provide on-going go-to-market advice, as well as technical maintenance and support. Forecastmanager was designed, built and was live on the Salesforce AppExchange within 6 months of the start of the project. The User Experience is excellent and the App is already delivering significant value to a number of businesses, as it provides greater ability to Qualify, Commit and Close sales opportunities. Plans for more Apps from Forecastmanager are in the pipeline. The Forecastmanager project provided Apptituda with the opportunity to demonstrate the huge value to customers of its broad capabilities from concept to launch to post launch go to market and technical support. In-gage is a consultancy and training company specialising in Contact Centre performance improvement. In 2015, they were in start-up mode and had limited resources. They identified the opportunity for an App which would help improve customer interaction by providing real-time performance data. This is used within contact centres, to identify gaps in the personal performance of managers and staff and to help them improve their capabilities in a structured manner. In-gage’s own developer had coded much of the app, but did not have sufficient expertise in Salesforce to get it through the Salesforce AppExchange on-Boarding Process and Security Review. Apptituda was recommended by Salesforce, as Ingage urgently needed technical and development support. Apptituda also helped Ingage with the development of its business plan and integrated go-to-market and sales plans, as well as how to effectively manage its relationship with Salesforce. completion within a very short time scales (of one week) of the Salesforce AppExchange Boarding process and Security Review, as well as delivery of necessary technical development and remedial action. contribution to Ingage’s business planning, as well as joint development of its marketing, sales and go-to-market plans. Apptituda, helped Rod Sherriff and Roxy Humphries to successfully get Ingage off the ground. We did this by providing both development and technical consultancy and business and go-to-market planning including marketing, sales and Salesforce relationship plans. The timing of these inputs and the way in which they were delivered and remunerated, were all designed to add value, in the best way and at the right time and to help Ingage quickly get to revenue. Ingage’s own internal development resource had completed early work on the App, although rigorous Salesforce development processes had not been tightly followed. As a result, the quality of code was generally good but patchy. Ingage put the App through the Salesforce Security Review, but unfortunately, it had not passed. Speed to market was critical for Ingage, so Apptituda was asked to get the App through the Security Review and Listed on the AppExchange as quickly as possible. We quickly assessed the quality of the code and identified areas which required remedial action and further attention without impacting the core functionality. Also critical was Apptituda’s ability to maintain a balance between delivering quality and a pragmatic and economic outcome. We introduced rigour to the development process based on best practice development processes and put in place the necessary re-engineering and fixes. This work was delivered in a blended way using Apptituda’s offshore development centre, as well as project management and technical assurance from the UK and illustrated the value of using our experience as a Product Development Partner. At the time, Ingage was a relatively new business and was experiencing many of the issues common to start ups. To help Ingage, Apptituda proposed and agreed pragmatic, innovative and flexible commercial terms, which enabled Ingage to benefit from Apptituda’s go to market advisory, as well as the technical and relationship skills needed to get the app successfully to market. Apptituda helped Ingage to get to market more quickly and in a better way. Within a week of Apptituda being asked to get involved, the Ingage App passed its Security Review and within a further 2 days, the App was listed and well positioned on the AppExchange in record time. Using the Go-To-Market, Marketing and Sales plan jointly developed with Apptituda, Ingage won its first customer within 2 weeks of the App being added to the AppExchange. Apptituda is now helping Ingage to integrate and configure the App for their new customers of Ingage and in future, there is potential to integrate Ingage’s App with other Salesforce and AppExchange products. Apptituda demonstrated its ability to rapidly respond by getting the App onto the AppExchange and to market in a very short timescale.